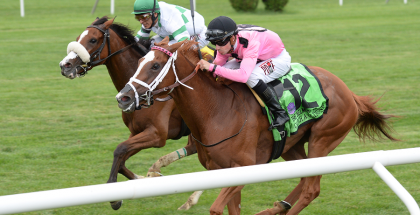 Imagining Wins Man O’ War Stakes: Imagining won the GI Man O’ War Stakes at Belmont Park in Elmont, New York on Sunday, May 11, 2014 for Hall of Fame trainer Claude “Shug” McGaughey. The victory on the inner Turf at 1 3/8 miles was McGaughey’s third straight Man O’ War Stakes win. Imagining and a smiling Joel Rosario head for the Man O’ War Stakes Winner’s Circle at Belmont Park on Sunday, May 11, 2014 for tainer Shug McGaughey. Imaging and jockey Joel Rosario crossed the 2014 Man O’ War Stakes finish line in 2:14.33. Imagining took the lead in the opening quarter mile alongside Frac Daddy and met Grandeur and Real Solution in the final stretch making for an exciting race at Belmont Park. 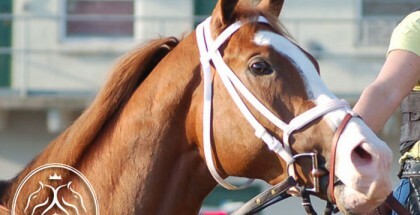 The six-year-old son of Giant’s Causeway will now point to the Manhattan Stakes on June 7th, Belmont Park Day. 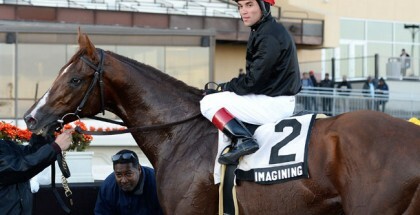 Imagining was the 2nd choice favorite at 3-1 behind Amira’s Prince, who finished last. Phipps Stable’s Imagining is now five for five at Belmont Park and has earned $813,114 with a total of fifteen career starts.